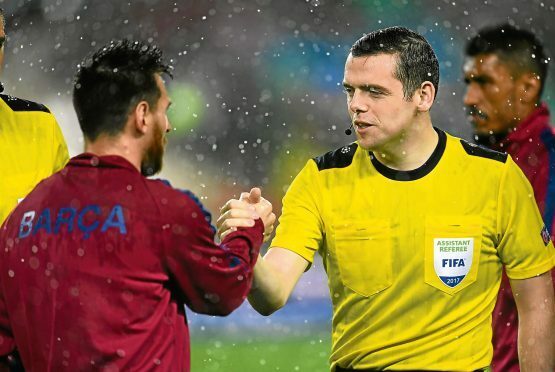 Douglas Ross, who represents Moray, found himself in the middle of a political storm last week for skipping a vote to be linesman at a Champions League match in Barcelona. And now the Conservative has told the football authorities he will no longer accept assignments when parliament is sitting. Mr Ross told the Press and Journal last night: “I have been blessed to reach the top level in my chosen hobby and occupation and in all fairness to my number-one priority, as Moray’s MP – I recognise I can no longer do both. “I’m greatly indebted to the many local people who expressed their support for me to continue to referee as well as be their MP. Mr Ross’s ousting of SNP heavyweight Angus Robertson when he was a Highlands and islands MSP was one of the biggest shocks of this year’s snap election. Immediately after being voted to the House of Commons, Mr Ross told the P&J he would continue with his refereeing career when it “did not interfere with his parliamentary duties”. He immediately came under fire, and last week he was widely condemned as “Two jobs Ross” for missing the universal credit debate to officiate in Barcelona – an assignment that earned him more than £1,000. The decision saw the Conservative mixing with Lionel Messi at the Nou Camp, after refereeing Cristiano Ronaldo for Real Madrid earlier in the season, instead of discussing benefit changes. Prime Minister Theresa May was forced to come to the defence of her back-bencher after SNP MP John McNally called for him to be “shown a red card”. However, yesterday Mr Ross stressed he would have been unable to speak in the debate anyway, due to the amount of other members wanting to contribute. He explained he had struck an agreement with an opposition MP to also miss the vote to cancel out their absences – a Westminster practice known as “pairing”. Last night the Alves resident maintained he had not broken his commitment to not let football interfere with his duties – and said he had contributed to another universal credit debate this week. Mr Ross began refereeing in the Forres Welfare League nearly 15 years ago but accepts he can no longer chase his dream of taking to the field at next year’s World Cup. He said: “As a referee, whenever I pull on my international kit I have a huge sense of pride in representing my country at some of the top matches across the world. “But as MP for Moray I gave a commitment to the people who elected me that I would always act in their best interests, which is why I have taken this decision. “While my dream of officiating at the biggest football tournament in the world is now over, I hope I’ve shown current and future referees from our area that there are amazing opportunities out there.